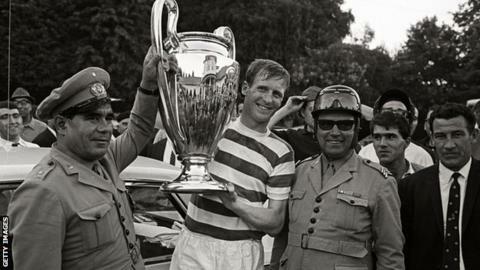 Celtic's European Cup-winning captain Billy McNeill has been awarded the "One Club Man" honour by Athletic Bilbao. McNeill, 79, led the Lisbon Lions to become European champions in 1967, the first British side to do so. Over his 19-year playing career, all of the defender's 822 club games were in green and white, a Celtic record. "The choice of Billy McNeill as OCM transcends the player's extraordinary individual career links directly to the team he captained," said Bilbao. McNeill's playing career began in 1957 in what became a golden era for the Glasgow side. During his time as a player for Celtic, the centre-half captained them to nine league titles in a row, before leading the Lisbon Lions to the European Cup by defeating Inter Milan 2-1. "Celtic won the 1967 European Cup against Helenio Herrera's Inter Milan (2-1) with a squad made up entirely of Scottish players, all born within a radius of less than 50km around Glasgow," said the La Liga club, who are renowned for their unique singing policy of selecting players from the Basque region in Spain. "The principle of territoriality, the same principle that Athletic Club has upheld throughout its history and of which it is today the only representative in the five major European leagues, is taken to its highest expression and personalised in a mythical figure for Celtic fans, Billy McNeill." Voted as the club's greatest ever captain, the 79-year-old's family confirmed in 2017 that he has dementia, having been diagnosed in 2010. "At present, Billy McNeill suffers from dementia and is in a delicate state of health, which will prevent him from receiving the award in San Mames personally, as has happened with the previous winners Matt Le Tissier, Paolo Maldini, Sepp Maier and Carles Puyol," added the Spanish side, who set up the award four years ago. "Athletic Club will make public in the near future the relevant information regarding the award ceremony." Celtic Chairman Ian Bankier added: "This award is a fantastic recognition for Billy and recognises the phenomenal contribution he made to Celtic over so many years. "A towering figure in the history of our great club, Billy's achievements at Celtic form a legacy which we will always be so thankful for. "Billy has always represented Celtic at all times in the best of ways with true integrity and professionalism and is someone who has always been the finest ambassador for the club."